What Huge Star Wars: Episode 7 Spoiler Did J.J. Abrams Just Reveal? Two big, fat Star Wars spoilers for Episode 7 have been released into the ether of the Internet. One rumor was churned up by the director himself. And the other? Well, the other is a huge, huge, huge freaking reveal—those of you who want to remain untouched for the great Star Wars reawakening should cover your eyes. 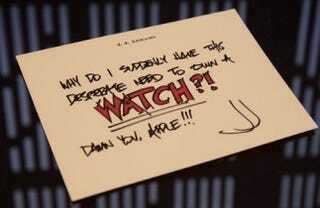 Yesterday during the Apple announcement madness, J.J. Abrams tweeted out this little gem. And obviously we're going to dissect the hell out of it right now. First up, I gotta give credit to J.J. Abrams for the way he's handled Twitter. By writing notes but not outright writing the tweet itself (presumably), he's removed himself from the entire online monster. It's perfection. And on top of getting his two cents out there, he also gets to place hints or Easter eggs in the background, thus enabling Star Wars gossipers to launch into another "What could it mean?" tizzy—as I'm about to do. So, what did this tweet reveal? Hopefully something BIG about the Empire. If you're familiar with the background lights, you'll note that this pattern is very similar (but not totally identical) to the Empirical light work on display inside the Death Star. Basically these are bad guy lights, people—Empire villain lighting. And there's really only one reason you'd recreate this iconic patten, and that's to tease the Empire in some manner. But how? Does this mean there's another Death Star in the works for Episode 7? Your guess is as good as ours. Seems like a big reach, but not a huge one. Hey, it could also be repurposed walls, or a sign that the Empire has not totally been "extinguished," so to speak. And why wouldn't it? Just because the Rebels won the war doesn't mean they've blotted out all signs of the Empire. Why wouldn't there be pockets of hold-out Empire purists scattered throughout the galaxy? Big guess, but still it's worth a little thought. Next up is the big, BIG spoiler here. While flying around taking aerial shots of the landscape, twitter used FlyMAC accidentally spotted THE Millennium Falcon. I mean there it is, just sitting there. So close. Amazing. Want to touch.